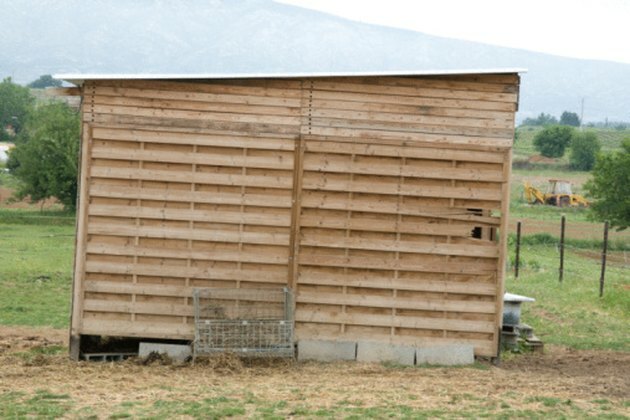 Sheds are simple and handy constructions for the do-it-yourself minded homeowner. No wiring, no air conditioning, no insulation—just a wooden frame and paneled structure to keep tools and lawn care equipment out of your household. The downside of a shed is that it's constant exposure to the elements puts it at a high risk of rot. When rot happens, you can replace the rotten portions and rebuild the shed to make it as good as new again. Wooden sheds are susceptible to rot, but you can replace or reinforce rotten studs to make them like new again. Clear your tools and equipment from the inside of the shed. Look around the interior and exterior of the shed for signs of rot: wood discoloration, apparent disintegration of the material and softness to the touch. Remove thoroughly rotten pieces of wood by prying nails loose with your claw hammer, starting with the external panels and moving inward to frame pieces. Saw more wood studs to the exact size of boards and panels that you removed from the shed. Nail them into the places where the rotted wood once resided, replacing frame pieces first, and then exterior paneling.